This classic ladder back bar stool comes in either mahogany or cherry. 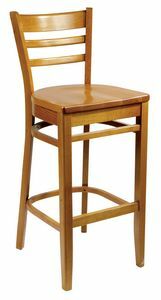 These are commercial quality bar stools and built for bar and restaurant use. They will work in many settings including your home. There is a 4 piece minimum due to shipping restrictions.